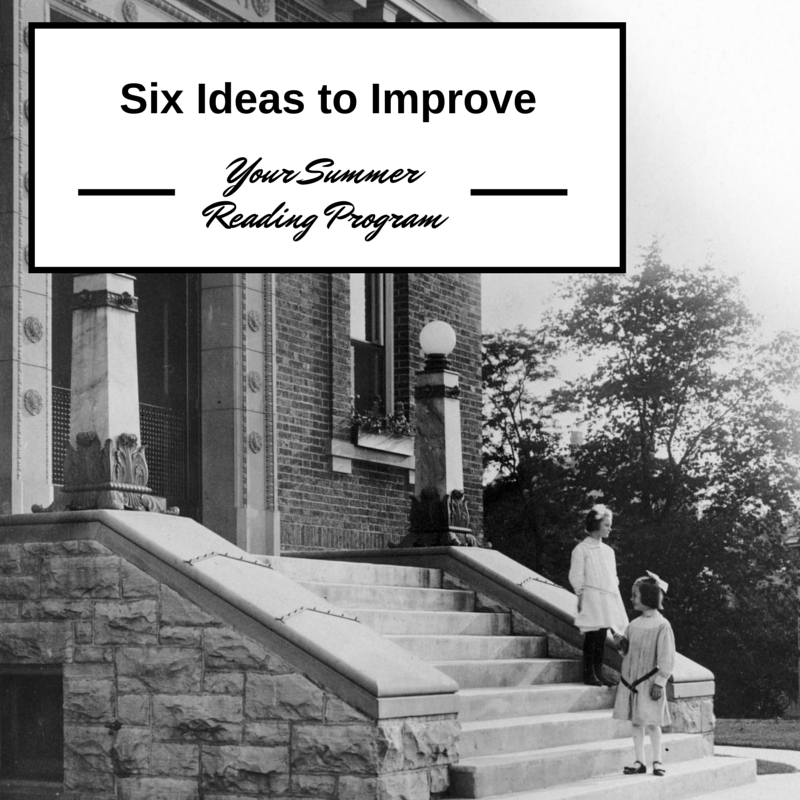 Six Easy Ideas To Improve Your Library’s Summer Reading Program – Super Library Marketing: All kinds of marketing ideas for all kinds of libraries. I love you guys. I love this industry. I want every single library to succeed because, when they do, the industry as a whole grows stronger. Sometimes, it pays to take a long, hard look at what we’re doing and to ask ourselves if we can raise the bar. That’s the task my co-workers and I decided to undertake last week. Our summer reading program is coming to a close and we wanted to get some idea of how well our website–a main portal to our program–was set up in comparison with other libraries across the country. We wanted to see if we could find ideas for improvement from our library friends. We wanted to raise the bar. I asked some of my friends in the library marketing space to send links to their summer reading websites and to sites they love. Then my co-workers and I sat down and tried to look at each one with the mindset of someone who knows nothing about the program–a first-time customer searching for information about summer reading, how to take part, and about prizes. We were mindful of one fact: we want to reduce the barriers to usage for our customers. We want to create the best customer experience possible to increase participation and make our program so great, so irresistible, that people rave about it to everyone they know. Participation requirements for summer reading programs need to be super easy. Most libraries ask their customers to jump through several complicated steps to earn a prize. Some ask customers to read, attend programs, fill out paper forms, then head to a branch to claim a prize. We think that’s too complicated and will only serve to deter participation. Summer reading should be three-step maximum– read, log your reading, claim a prize. If you want to push participation in programs, I suggest making that a side order: let people earn extra prizes by attending a program at your branch. Don’t make it a requirement of your main summer reading program. Language and format on summer reading websites needs to be clean, simple, and conversational. Lay out your website using big, easy-to-read fonts and very simple lines. Don’t be afraid of white space! Explain participation and prizes in conversational language. Do not use “library terminology.” We saw one website advertise a prize on the children’s section of their summer reading site with this line: “Win a membership to a cultural institution!” Why not say, “Win a membership to the children’s museum!” It’s easier and more enticing. Make sure it’s super easy to get to your summer reading website section from the homepage of your website. This was a huge obstacle for my staff. We had a terrible time finding the summer reading section on about half of the websites we sampled. And we’re in the industry, so if it’s hard for us, it’ll be hard for the customer. Remove the barriers to difficulty for customers and your participation numbers will grow. Prizes need to be truly enticing. This is a sticky situation for many libraries. It takes a lot of money to buy good prizes for your program–or it takes a lot of time and schmoozing to get sponsors to give you great prizes. It’s worth it. I truly believe that if you want high participation levels, you need to have something of value to entice your customers. In my experience, a used book isn’t going to do it. Some of the best prizes we saw –a bookmobile party, capes with the library logo on it, a chance to grab a prize inside a special prize vault–were creative and not terribly expensive. As I’ve seen with our library’s program, the right prizes are crucial to ensure participation. Give your customers the ability to sign up online. Many libraries require a person to show up at a branch to take part and, while I see the value in that, I think it’s crucial that you have an online sign-up option. There is a portion of the population who will not take part in anything if it requires them to leave the comfort of their living rooms. And what happens to kids whose parents can’t or won’t take them to the library? Invest in online sign-up system and watch your participation numbers grow exponentially. Make sure you offer a summer reading program for adults too. It was surprising to see the number of libraries with programs for only teens and kids. Children who see the adults in their lives reading are more likely to read themselves, right? So why not entice parents to participate as well. My library has been beefing up the adult portion of its summer reading program for several years. We still have a long way to go in dispelling the myth that summer reading is for kids only, but our participation numbers have slowly increased as we keep driving promotions and features geared toward grown-ups. I’d love to see more libraries do this! Thank you so much for this post and evaluating a number of summer reading programs. I really love your Summer Reading Website: the visual booklists, how it is very clear where to find things and not bogged down with too much information. I also love how your prizes all match your theme. I notice you require a library card for signup, do you see that as a barrier to participation in the summer reading program or does it give you a bump in library card signups in the summer? Just curious. Thanks again! It gives us a huge bump in library card signups in the summer and allows us to track the usage of those participating in the program. We use targeted email messaging, and we base the messages we send to each cardholder on how they use the card. It’s pretty handy! At my last library, staff were awarded a $25 Twitter gift card for signing up the most people for Summer Reading. This was a great way to get Circulation staff involved, especially Circ staff who already have relationships with regulars. We’ve been doing a Summer Reading Program for adults for many years now, but it’s grown increasingly difficult to get adults to sign-up. I got many good ideas from you, but I’ll let you in on a secret that helped us this past summer: we gave kids an extra entry for a grand prize if they got an adult (parent, grandparent, adult sibling, etc.) to sign-up for Summer Reading, too. This made our kids excited because of the extra entry and boosted our adult sign-up numbers. Not all of the adults participated, of course, but I saw many new names on book entries this year that probably wouldn’t have participated had their children not gotten them to sign-up. Great idea-I might steal it. Thanks for sharing! Three Secrets To Reach a New Audience For Your Library – Super Library Marketing! Great marketing ideas for libraries everywhere.